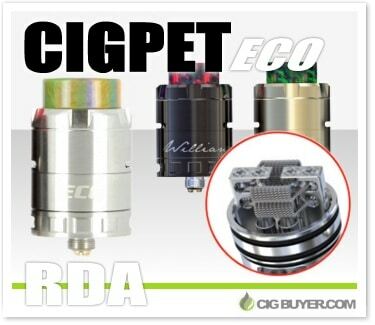 The IJoy Cigpet Eco RDA is an extremely attractive and versatile 24mm rebuildable dripping atomizer featuring a two-post, six terminal build deck that can accommodate a huge range of different builds. It has dual adjustable bottom and side airflow, which can be independently adjusted via a bottom AFC and adjustable top cap. Available in black, matte gold, matte silver and stainless steel, each Eco RDA comes with a uniquely colored, 15mm bore acrylic resin drip tip to give it a splash of style.